The download links on this page are for promotional purposes only. These are meant for DJs, people from the press and other people from the music industry. If this does not describe you, please respect the work of the artists and obtain their work through normal commercial channels. Thank you! The zipped files and the folders of the individual song types all also contain the full cover art, liner notes, full lyrics, a one sheet about the recording and the artists and some additional files. Click here to access a folder with three zipped files, one of 320kbps MP3 files, one of WAV files and one of FLAC files. Please let us know you visited this page. This is NOT required, but it would be nice to know. Thanks! Your radio station and show, your publication or other affiliation. Would you like a physical CD also? If you want a physical CD be sure to put your mailing address in the comment section. Richard Ruane and Beth Duquette’s new album Notch Road has an official release date of May 4, 2018. It is on Riptone Records of Ripton, Vermont. It will be available through CD Baby and most online and local sources. 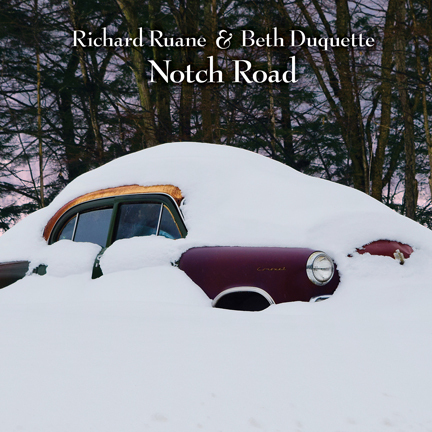 Notch Road is the first album by Richard Ruane and Beth Duquette as a duo. Along with bassist Mitch Barron they performed for eight years as Bread and Bones and released two albums, one of which was named Vermont’s Traditional Album of the Year by Vermont’s Times-Argus newspaper. They were nominated by two folk DJs to the Northeast Regional Folk Alliance’s DJ Showcase and the trio performed as Emerging Artists at the Falcon Ridge Folk Festival. Notch Road has Richard Ruane and Beth Duquette swapping leads and harmonies on original songs that show a deep devotion to traditional ballads, 1930s style jazz and just plain originality. Ranging from the light-hearted to the serious, the songs cover making stuffed clams in a factory, the toll addiction takes, lost love, living happily with love, two crows conversing, and imagining an extended personal ad from the Vermont Seven Days weekly newspaper column “I Spy.” Many of the songs have a strong sense of place with specific references to locations around Vermont and elsewhere. The two cover songs on the album are Saint James Infirmary, with additional words and a new refrain by Ruane, and the whaling ballad “Harbour of Typee” attributed to the great songwriter/song collector, Ewan MacColl. Duquette sings and Ruane sings and plays octave mandolin, guitar, tenor guitar, ukulele and mandolin. They are joined on this album by Mitch Barron on acoustic and fretless bass and vocals; Matt Flinner on mandolin; Michael Chorney on electric guitar; Patrick Fitzsimmons on percussion and vocals; Phil Henry on banjo and vocals; Wendy Sassafras Ramsay on clarinet, accordion and vocals; Stephen Rooney on trombone; Alice Weston on tuba; Allison Norton Henry on vocals; and Rick Wilson on electric bass. In addition to being musicians Ruane and Duquette have long been active as presenters in Vermont’s acoustic music scene. Currently they are co-directors of the Ripton Community Coffee House, a once-a-month concert series based in Ripton, Vermont, and Ruane is president and Duquette the head of the programming committee for the Middlebury Festival on the Green, a week-long series of noon-time and evening concerts in Middlebury, Vermont, which happens every July.